Yard waste, consisting of grass, leaves and other garden debris, comprises an estimated 18 percent of the annual municipal waste stream. Sending yard waste to the landfill puts an unnecessary seasonal burden on the municipal garbage collection system. Leaf waste can account for as much as 60 percent to 80 percent of the waste stream in the fall, and grass clippings can make up 50 percent. When this organic wastes break down in the landfill, it becomes a source of methane, a greenhouse gas 21 times more potent than carbon dioxide. If the yard waste is sent to a waste-to-energy plant instead of the landfill, the high moisture content of the waste reduces the burning efficiency of the waste-to-energy facility. Yard wastes are 100 percent recyclable, and its decomposition completes a natural cycle that creates a life-sustaining resource—compost. If you’re a Philadelphia resident, take advantage of the city’s Bagged Leaf Drive in the fall. The program usually runs from early November to mid-December. Dates for 2011 have not been announced yet, but check the Streets Department website (www.phila.gov/streets/LeafCollection.html) soon for more information. The Streets Department’s Sanitation Convenience Centers (3033 S. 63rd St., 19153; Domino Ln. & Umbria St., 19128; State Rd. & Ashburner St., 19136) accept yard waste year round. 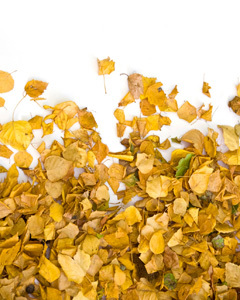 If you live outside of Philadelphia, find out if your community has a yard waste collection. Of course, the greenest option is to reuse the yard waste yourself. Set up a compost bin, remove the grass catcher from your lawn mower to recycle the grass clippings in place, or buy a leaf shredder to make your own mulch in the fall. You’ll create less waste, and you’ll save a few bucks by making your own garden compost and mulch.